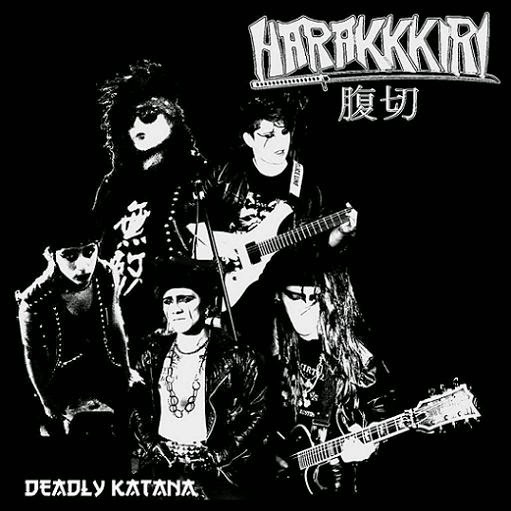 According to Dictionary.com, a ruse is best described as "a trick, stratagem, or artifice" and, indeed, Harakkkiri fits the definition to a T. Posturing as a band with Japanese origins, Deadly Katana certainly looks the part, but the thing is, Harakkkiri hails from Chile, despite appearing authentic down to the deceiving makeup and black-and-white cover. The music has little, if anything, to do with the aesthetic, so if you find yourself thinking, "what gives?," you're not alone. To make it simple, Harakkiri is essentially a tribute to classic, Japanese metal bands and wear their influences on their sleeves with the utmost pride. Loudness, Damzell, and others were clearly sources of inspiration, but if you dig past the cover art, a dash of early Sodom and various punk acts from outside of Japan also made the cut. It's an interesting combination of influences--a bit like a melting pot--but it's charming and works, at least for Harakkkiri's purposes, which admittedly aren't deep or very thoughtful. Musically, Deadly Katana isn't adventurous and channels older speed recordings while, at the same time, occasionally taking a slight step back into heavy metal territory. It's undeniably an enjoyable listen, as such, but it's nothing to run out and grab right away. In fact, if you've heard any of the bands listed above, you'd be hard-pressed to find new sounds to enjoy, but the single is a worthy installment in the speed metal genre. You just have to be willing to accept Harakkkiri as a tribute more than anything else.